Sweet Sixteen Planning Guide - Save Thousands With Our Planning Tips! A sweet sixteen party is one of the biggest moments in a persons life! Planning can seem daunting or might happen quicker than you anticipated but this sweet sixteen planning guide will help you plan the best party ever! MTV’s show “My Super Sweet Sixteen” has shown that just about anything is possible for a sweet sixteen party, these guidelines will help you create a party as big as you can dream. Be sure to check out our other ideas for sweet sixteen decorations, sweet sixteen cakes, sweet sixteen themes, and DJs for your ultimate sweet sixteen party! Find a venue. The place where the party will be held, this will dictate the rest of the details of your party from decorations, to cost, to look and feel — everything. Pick colors and a theme Masquerade, highlighter, dress to impress, “clubbin the night away” pretty in pink can all be great themes. Colors that complement each other, pink and green, pink and black, red and black, brown and light blue will make sure your event, lights and decorations all match and look great! 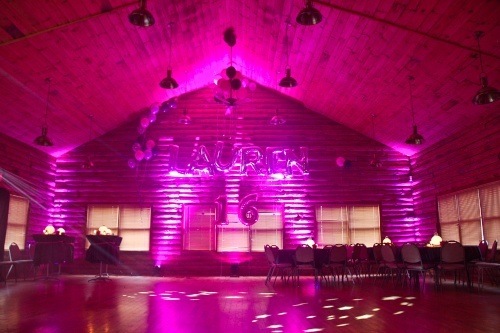 Lights are an important part of your Sweet Sixteen and can turn it from drab and boring into a real party! Your entertainment can help you pick out lights that can match the colors of your event, put together custom slideshows, show your name in lights around the room (monogram lighting), sound activated lighting and haze to make your party feel just like the ones you’ve seen on TV. Pick the right entertainment – The key to the party is the entertainment. If you pick the right DJ or the right band then it will make sure that you and your friends have a blast. Many times the entertainment can bring awesome “Club” style lighting to your party to make it feel just like TV. Find someone that has all the latest music, lights, games and more to keep all of your guests having a blast so no one leaves early. The Cake – Will you have the cake custom made, or will you pick one up from the local Costco or grocery store? Make sure the cake fits in to the overall theme of the party (colors, decorations, etc). Photography – Having someone to take pictures will make your event feel bigger and help you keep all the great memories you’ll make forever. Decide whether you are going to hire a professional, if they have shot Sweet Sixteen Parties before, what kind of style they shoot (traditional, photojournalistic, artistic, etc. ), and what kind of packages they offer. Many times your DJ or entertainment company can either provide photography or suggest people in your price range. Having party professionals who work well together makes sure that your party will go as smooth as possible. Grand Entrance – How will you enter the room? What song do you want playing? Will you have a red carpet entrance? What sweet sixteen jewelry will you be wearing? Will you come in by yourself or with your VIP’s and closest friends? Maybe a paparazzi entrance with photography everywhere? Work with the DJ to think of something original for you. Outfit – Picking the right outfit is crucial, try to match the colors of the event or pick a bright color so that you stand out and look your best. After party – After the party is over where are you and your closest friends going to afterwards? Many times people will get hotel rooms or will have a sleepover back at their house complete with food, drinks and movies. Having a solid plan for after the party will make sure your day is complete. Plan everything out and have a timeline, you should be able to work with the entertainment or the venue to come up with a timeline complete with time built in to account for guests arriving “fashionably late” and to have a place for you to relax before your big grand entrance. Make sure you have sweet sixteen favors to hand out to guests at the end of the night. With the help of this sweet sixteen planning guide and the list above you’ll have the Ultimate Sweet Sixteen Party!